Many people, particularly those promoting and propagating religious beliefs (in all major religions), had over the years laid claims that Albert Einstein was a man of religious conviction. They often put forward Einstein’s famous quote, “God does not play dice”, implying that belief in God’s harmony and absolutism in creation was inbuilt in Einstein’s thought process. Nothing, I emphasise nothing, could be more egregiously misinterpreted and misrepresented than this. Albert Einstein was not a man of religious conviction by any standards. His religious views, if considered dispassionately, would verge on the side of atheism; although he did not like him to be branded as an ‘atheist’. His views on religions were very well contained in his one and half page letter, written in German in 1954 (just a year before his death) to the German philosopher, Eric Gutkind, which contained, “The word God is for me nothing more than the expression and product of human weaknesses, the Bible a collection of honorable but still primitive legends, which are nevertheless pretty childish”. He also said, “No interpretation, no matter how subtle, can change this”. That letter had been sold in an auction at Christie’s in New York only a few days ago (2018) for the staggering sum of $2.9 m (£2.3 m). That “God does not play dice” was not said by Einstein out of devotion to God, but as a retort to the underlying theme of “Copenhagen interpretation” produced by Niels Bohr/Heisenberg and others on quantum mechanics. Although Albert Einstein and Max Planck were the pioneers of quantum concept in the first decade of the 20th century, subsequent developments of quantum mechanics by Niels Bohr / Schrodinger / Heisenberg / Pauli / Dirac and many more leading to probabilistic nature of objects (elementary particles) were very much disputed by Einstein. An object is either there or not, it cannot be half there and half not; Einstein contended. In that context, he rejected the probabilistic nature of objects by that quote. He also said, the moon is there on the night sky whether we observe it or not. Just because we cannot observe the moon because of cloud in the sky does not mean the moon is not there! However, quantum physics was relentlessly moving forward into the probabilistic interpretation of objects and successfully explained many hitherto inexplicable physical processes. Einstein struggled the latter part of his life with the nature of reality. 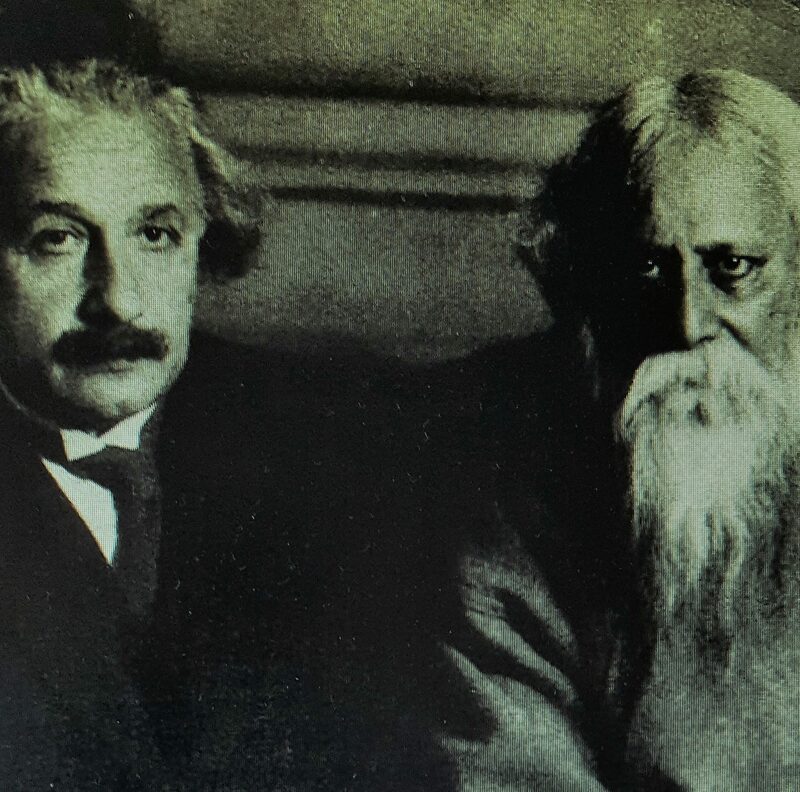 When Tagore and Einstein met in Berlin in 1926 (and at least three more times until 1930 meeting in New York), they had a very fascinating philosophical discussion/debate, not so much on the existence of God but on the nature of reality. Tagore held the Eastern philosophical view of convergence of man (meaning life) and nature, Einstein held the view of ‘absolutism’. In the letter, Einstein, an Ashkenazi Jew, also articulated his disenchantment with Judaism. “For me the Jewish religion like all others is an incarnation of the most childish superstitions. And the Jewish people to whom I gladly belong and with whose mentality I have a deep affinity have no different quality for me than all other people,” he wrote. However, as a child he was religious; as is the case with most of the children of religious families anywhere in the world. But he had a fiercely independent mind and a deeply inquisitive trait. He disliked authoritarian attitude – whether in teaching or training. He was very unhappy at the Luitpold Gymnasium (a strict discipline focussed school) in Munich, where his parents enrolled him for proper education. He described later that he deeply disliked the ‘rote learning’ method at the school with no opportunity for creative thinking. He, however, remained at that school to keep his parents happy. Years later, he advised people, “Learn from yesterday, live for today, hope for tomorrow. The important thing is not to stop questioning”. Einstein did not or could not completely discard the notion of supremacy of the supernatural power, which became inbuilt in his childhood, although he rejected consciously the idea that this religion or that religion derives from the orders or massages from God. By the age of 13, he started doubting the religious teachings and “abandoned his uncritical religious fervour, feeling he had been deceived into believing lies”. He believed in or had strong inclination towards “Spinoza’s God” (Baruch Spinoza, a 17th century Dutch thinker), “who reveals himself in the lawful harmony of the world, not in a God who concerns himself with the fate and the doings of mankind”. Einstein had the same or similar mindset. This streak of thinking had a strong resonance with the Eastern philosophy that man and nature merge into one or have strong inter-connection. The physical world follows a set of laws and principles with specific physical constants relevant to the natural world. Any variation of these laws and constants would negate the existence of this universe and could possibly generate another universe. That may be the underlying thinking in the idea of multiverse. So, to claim that a grand designer created this universe with specific set rules and laws for our habitation in mind is a mendacious presumption. – Dr A Rahman is an author and a columnist.